I like the idea of putting the gear track on the gunnels of my revo, but Im concerned about the strength to hold up my gear. I currently have two RAM rocket launcher rod holders, and my FF mounted on them. How strong is it? I fish fresh and salt, and my salt water rods are much heavier, and will torque the gunnels with the weaving of the waves, fish, etc. I have also wondered the same thing. On my Revo 11, I currently only have a fishfinder mounted on a ram ball on the left gunnel. I want to replace that and get two narrow geartrax for each side (because thats all that will fit). BTW, in saltwater conditions, bouncing through the waves, do you find that those ram rocketlaunchers shift a lot? I mean do you have to tighten the heck out of them for them to stay up, or are they pretty sturdy and maybe sturdy enough for trolling? I've had no problem with my ram balls. I troll allot with mine. I've caught bluefish, stripers, and snagged the bottom with no problem. The big trick is to not tighten your drag too much. Keep it just tight enough to do its job, but not so tight that the rod holder would get pulled down by a fish, or if you get snagged. My ram balls are backed with plastic cutting board and fender washers to spread out the stress on the hull. Ah, this is what I plan to do for the gear tracks too. I have just installed YakAttack GearTracs with FullBack backing plates on my Oasis. It was a tight fit installing the backing plates but very solid. The front backing plates needed to have the edges rounded over to fit. I would not purchase the FullBack plates with the optional supplied hardware as the screws are 5/8" long and you will need 1" in length. Very pleased with the YakAttack products and would recommend them if you want a clean, solid and versatile mounting system. Take the ram balls and sand them a bit. Roughs them up and helps grip. I have the GT90 geartracs with the backing plate on my gunnels. Yakattack;s backing plate for the GT90 is aluminum and threaded. It makes for a super easy install (no nyloc nuts or washers) and spreads the force over a greater area. 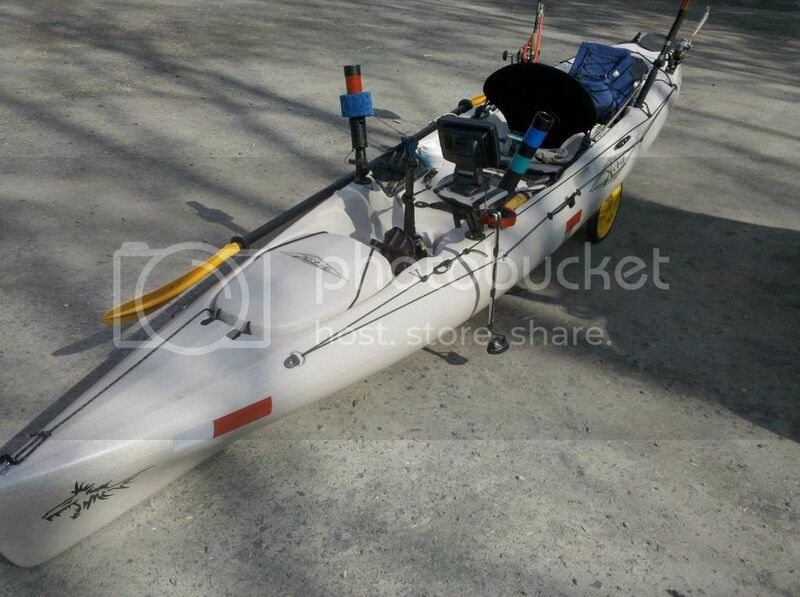 However, if you are in the water, the force that can be placed on the gunnels will be limited as much of the force will be transferred through the kayak and into the water which can be observed via the kayak rocking. Here is the topside with the 12" trac. I have since changed it to 16" but in retrospect the 12" was a better fit. Thanks for the pictures guys, they help a lot. What is the widest backing plate I could go on the revo 13 along the gunnel? 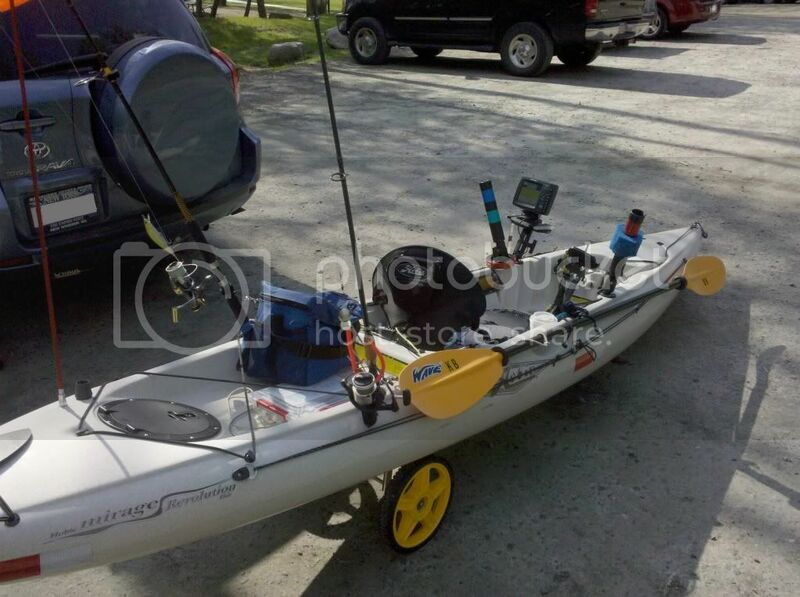 Im really liking the cleanness when everything is taken off the yak. As it is, I have RAM balls left on when I take the rodholders and FF off. Yes, the pictures are on my Revo 13, 2012 model. The GT90, I am guessing is .9 in. wide. The GT175, I am guessing, is 1.75 in. wide. The GT90s are made like they were meant for the Revo and Adventure. I don't know how wide you can go with a custom backing plate but I have had no problem with my setup. 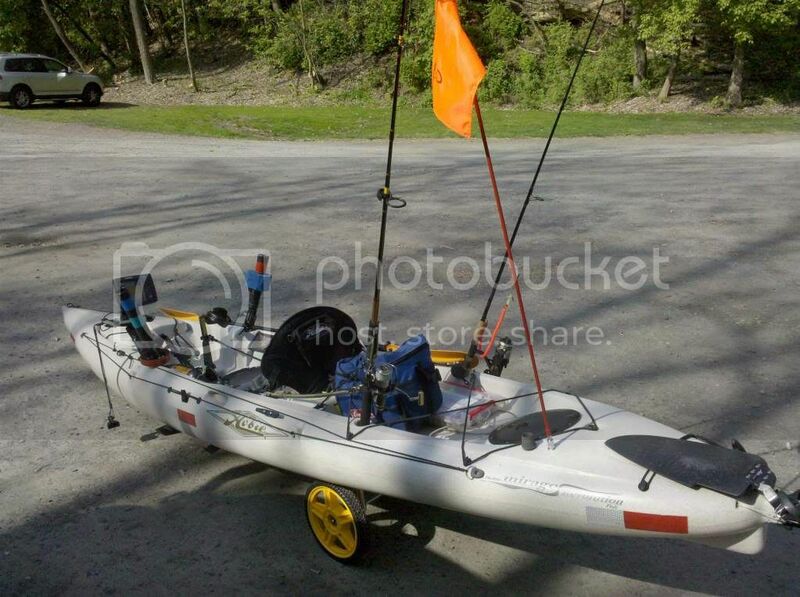 I love being able to strip the kayak bare and load it up as much as I want. 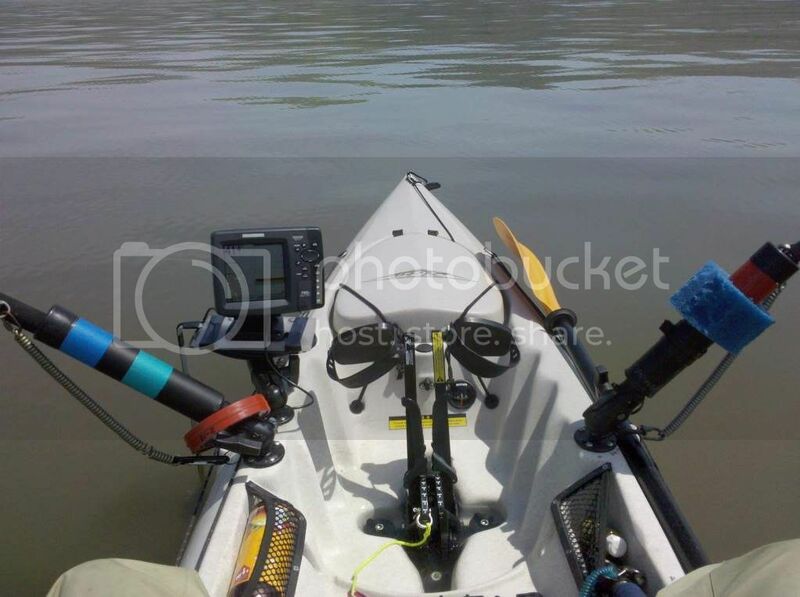 Be wary of using Gear Tracks for rod holder mounting if the rod holder is to be mounted on the left hand side. The reason for this is that the track system relies on a thread to secure mounted items in place. No think about the saying 'righty-tighty, lefty-loosy'. Thats right - any big fish will lever most rod holders loose on those tracks if the rod holder is pointing out to the side. Obviously, this is not an issue for rod holders mounted on the right, but it can be on the left. No, it's true. The difference between -tight to the track- and -loose enough to slide out- is less than 1/2 a turn. Port side screwballs for anything that can apply force (bow to stern) will be at risk. My FF is ok on one, but wouldn't trust a rod holder.